Robert Lloyd is the lead singer with The Nightingales and formerly with The Prefects. 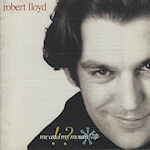 When The Nightingales split in 1986, Lloyd embarked on a solo career, signing to Virgin Records in 1989 and releasing the album Me and My Mouth. The album featured Steve Nieve and Pete Thomas (of The Attractions), Andy Scott and Craig Gannon (formerly of The Smiths among others).